Do you have clients who are traveling a lot or come to you only on vacation? Do you run a home studio but want to expand your Pilates business without the extra expenses? Teaching virtual Pilates classes can be just the right thing for you. Today people are used to doing pretty much anything online: pay bills, take college classes, connect with people and even public schools post a lot of home assignments online. The online world lets us save our precious time and explore the opportunities that wouldn’t be available to us in any other way. A lot of clients are interested in taking Pilates classes but they can’t commit either because of their tight schedule or limited budget. 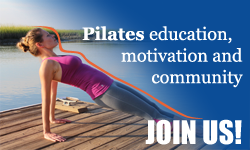 Some of the Pilates professionals have dedicated their career to bringing Pilates to those populations. Robin Long is an inspiring Pilates instructor who is following her passion for Pilates both online and offline. She obtained her comprehensive Pilates certification through Body Arts & Science International and was trained by the highly respected Kristi Cooper White (creator of PilatesAnytime.com). She works with a variety of clients: from those just wanting to get in shape, to those with injuries, Parkinson’s Disease, Pre-natal, Post-natal, back pain, scoliosis, hip replacements and more. She runs a Pilates blog at The Balanced Life Online, teaches at Park Meadows Pilates & Physical Therapy in Lone Tree, CO (near Denver) and works with amazing women through her online Pilates Body program. The pros and cons of running a virtual Pilates studio. The necessary tools to run an online Pilates program. What it takes to have a successful online Pilates course. What is one of the most natural events in the life of a woman? Pregnancy and birth, for sure. But women during pregnancy are often treated as if they were sick. Their exercise options are limited. They are not taught to learn their body and listen to it. They are not taught to enjoy this amazing time of their lives. Women are told what they should NOT do but very few exercise and medical professionals tell them what they SHOULD be doing for their bodies. Pregnancy and child birth are more than just a physical event in the life of a woman. It’s an emotional period that touches every aspect of her life. And she needs more than just an exercise routine that teaches her how many squats she can do and how fast she can run. Carolyne Anthony of The Center for Women’s Fitness has devoted her Pilates career to Prenatal/Postnatal Pilates. She’s been devoted to Pilates for over 30 years and her personal pregnancy has motivated her to create a Pilates program that doesn’t merely teach women how to exercise but teaches them to embrace their female physique and become aware of their bodies. Today we are talking about Prenatal Pilates. If you are a woman you will definitely benefit from listening to it. The instructors will learn helpful tips on how to work with Prenatal/Postnatal clients. And Pilates students will learn something new about their bodies. I was lucky enough to talk to Carolyne while I was still pregnant with my second set of twins. Her advice and her book (The Pilates Way to Birth) proved to be the most valuable resources for me. While still at the hospital after my C-section I used exercises that Carolyne shared with me to start reawakening my core and rebuilding my strength. I was truly blessed to connect with Carolyne and talk to her about pregnancy and beyond. How can Pilates be helpful for prenatal/postnatal clients? How can Pilates prepare a woman’s body for labor and beyond? Are there any special breathing techniques to help women through labor and delivery? How can one prevent and treat diastasis recti? What are your recommendations and main areas of focus for the instructors working with Prenatal/Postnatal clients? What do you see in the future of Pilates and how do you see yourself contributing to that vision as a Pilates educator? One of the most important skills for a Pilates instructor is being able to “read” the body in front of them. That’s the skill that will let you help your clients the most. That’s the skill that separates Pilates from regular fitness modalities. And that’s the same skill that can take years to develop. Completing a Pilates certification program doesn’t mean that you will develop that skill right away. It must be fostered, worked on and developed every day. And the instructor that you train with has an incredible influence of how fast you will develop your “eye”. I was lucky to start my Pilates training under Jennifer Gianni’s mentorship and she taught me to “read” the body in front of me. And that’s just one of the “secrets” that she shares with us in an exclusive interview for the Pilates Bridge members. Jennifer Gianni, a Master Pilates teacher, Balanced Body Faculty member, creator of the Fusion Pilates Pre/Postnatal DVDs who has over 20 years of experience in the mind/body field. She is also the creator of the Pre/Postnatal Pilates Certification program that she’s been teaching in her home studio in Asheville as well as across the USA and in Japan. the future of the Pilates Method. Rebecca is a Pilates pioneer; the first to teach business development at PMA, the first to launch an after-market “post graduate” program Pilates Excel, the first to provide customized curriculum and exclusive access to cadaver anatomy, the first and only to develop and freely share protocols to achieve idealized alignment and address common performance problems, the first and only to pursue the establishment of an independent safety standard credential. Rebecca completed her classical Pilates training in 2001 from Romana Kryzanowska, a protégé of Joe Pilates’, she is certified by the University of Washington in Sports Medicine and Human Performance, she is Pilates Method Alliance Gold Certified and has served on the PMA Board of Directors. Surprisingly, the question “What is Pilates?” is the one that we hear way too often even these days. To start our conversation, Rebecca, please give us your personal definition of Pilates. Most people who turn to Pilates do so because they already have some “issues” going on in their bodies. As instructors we want to help them rather than injure them (of course!) I know that you are big on Pilates safety. What are three main safety concerns when teaching a client? Classical Pilates has a lot of exercises that use spinal flexion. When taught and performed incorrectly these exercises can be a cause of an injury or further exacerbation of back pain and other painful symptoms. What are your thoughts and advice on “safe” Pilates flexion? What are the benefits of PNF stretching and release work in a Pilates session? Do you have any recommendations? You offer a lot of workshops and Pilates training courses right now. Can you tell us a little bit about your upcoming projects? What do you see as the main problem hindering the growth of the Pilates Method today? What’s your take on the whole modern vs classical Pilates debate? Can you share with us some of your personal Pilates mentors? Can you please recommend some resources (books, courses, DVDs etc) that would nourish any hungry-for-personal-and-professional growth instructor? Rebecca, what does it take to be an excellent Pilates instructor? Finally, what do you see in the future of Pilates and how do you see yourself contributing to that vision as a Pilates educator?